Reporting on your club's outreach events is key to maintaining membership in the NASA Night Sky Network. Regular event reports keep your club qualified to receive toolkits, free handouts (when available), and NSN award pins, and also gives your own club members a record of how past club events went. Having these online records can prove handy for outreach in locations with unique requirements, understanding how many visitors attended events, and in recording which club members volunteered their time and telescopes during outreach or other club activities. 1. Click directly on the reminder and a page will open, listing the event you may wish to log. 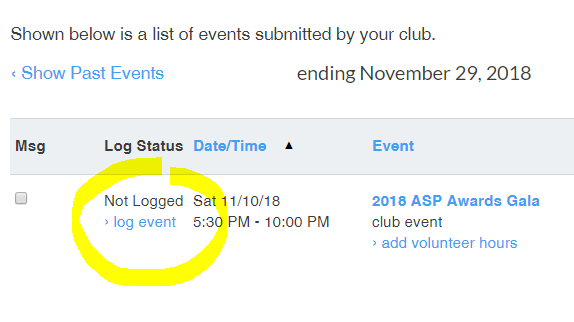 Then click on the "Log This Event" link to open the event log form. Alternately, you can list past events for your club, or click on the event from the club calendar. Open the event and click on the gray Log This Event button to open the log form. You can also enter in a few optional data points, including demographic information, topics covered, photos, comments, and toolkits used. 3. If you used any activities, resources or printed material from one of the toolkits at this event, please be sure to click to open the Toolkit drop-down menu, found under the "Provide a few comments..." text box. 5. Scroll down, then select whether or not you wish to display the log information publicly. 6. 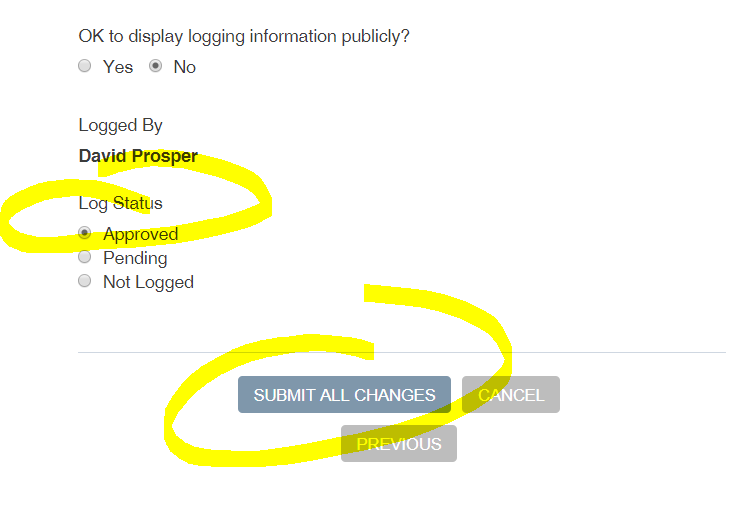 Then select "Approved" under "Log Status" if you are satisfied with the report. Scroll up if you want to review it and add any further data. You can also edit thee log afterwards if needed. 7. Click "Submit All Changes" and your event report will be saved and submitted. 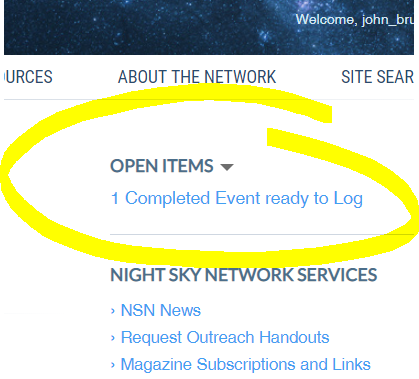 The event log system is the best way to let NASA know you are using their resources for your outreach events. The records of your club's outreach events show NASA how many people were exposed to NASA science as a result of your club's outreach and what materials, activities, and other resources are used the most. That is why it's important to report on how many people were at your event and what resources were used, including NSN toolkits and other NASA-related items. We of course love your additional demographic details, anecdotes,and photos in the logs, but we totally understand that not everyone has the time to exhaustively record every last detail of every event. As long as you record a rough estimate of the numbers of people served by your club and the resources used in your outreach, our goal of better understanding your club's outreach, your audiences, and the NASA science they are exposed to is met. For example, if your club held an eclipse event and you used NSN-donated eclipse materials, such as the solar eclipse glasses, handouts, or even used featured NASA eclipse apps, you can check the “Other NSN Resources.” option under “Toolkit Used” to mark that your club used NASA resources to when educating the public about astronomy! 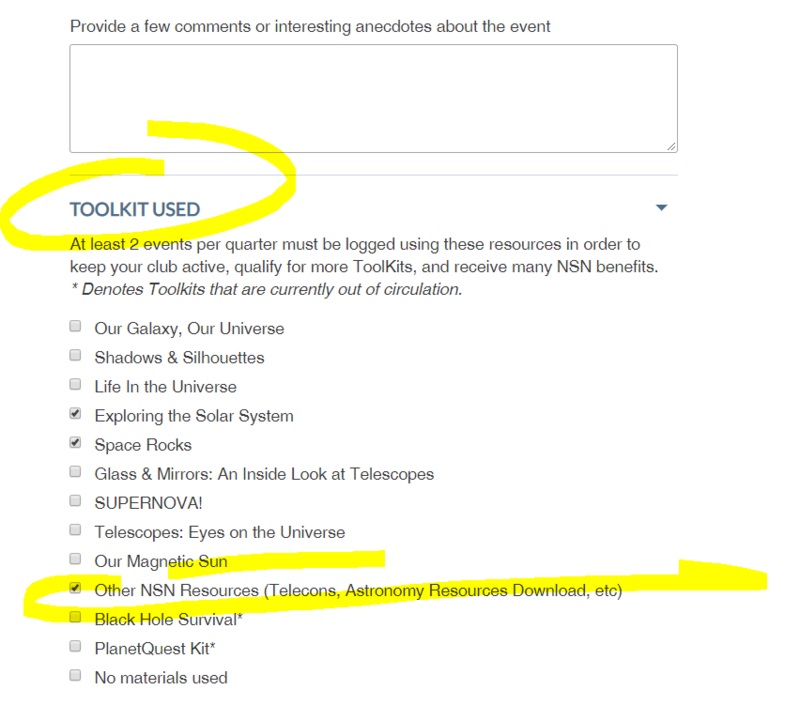 Of course, if your club also items from a specific NSN toolkit, like the planet models and sun poster from "Exploring the Solar System" or the Earth-Moon yardstick eclipse model from "Shadows and SIlhouettes", by all means please mark those toolkits down as used! Some activities don't require physical items but are indeed part of a toolkit, and can be marked as having been used as well.